Why Do Many Mistakenly Think Human Blood Is Sometimes Blue? : 13.7: Cosmos And Culture It's hard to disprove a falsehood when it seems to fit so seamlessly with other true, if poorly understood, propositions — and that's what's going on here, it would seem, says Alva Noë. Blood is red to the naked eye. Under a microscope, it depends. This isn't because it isn't really red, but rather because its redness is a macroscopic feature. Human blood is red because hemoglobin, which is carried in the blood and functions to transport oxygen, is iron-rich and red in color. Octopuses and horseshoe crabs have blue blood. This is because the protein transporting oxygen in their blood, hemocyanin, is actually blue. The blood of a vulcan is green, according to the story anyway, and this is presumably because the stuff that carries oxygen in the vulcan's blood is green. But our blood is red. It's bright red when the arteries carry it in its oxygen-rich state throughout the body. And it's still red, but darker now, when it rushes home to the heart through the veins. I bring this up because I've noticed that there are a fair number of people — some of the 7th graders my son goes to school with, some teachers, too, who ought to know better, as well as lots of people who have published online — who say that blood inside the body is sometimes blue. Here is some evidence that this isn't true. When I was 12, I was in an accident and my left wrist was ripped open so that I could see into my arm. Everything was red. Blood was shooting out of my arteries and sloshing out of my veins. And all of it was red. Here's another piece of evidence. If you get blood drawn, the liquid that comes from your vein into the vacuum sealed container is, plainly, red. We also know why it is red, as already noted. It's red because of the red blood cells (hemoglobin). 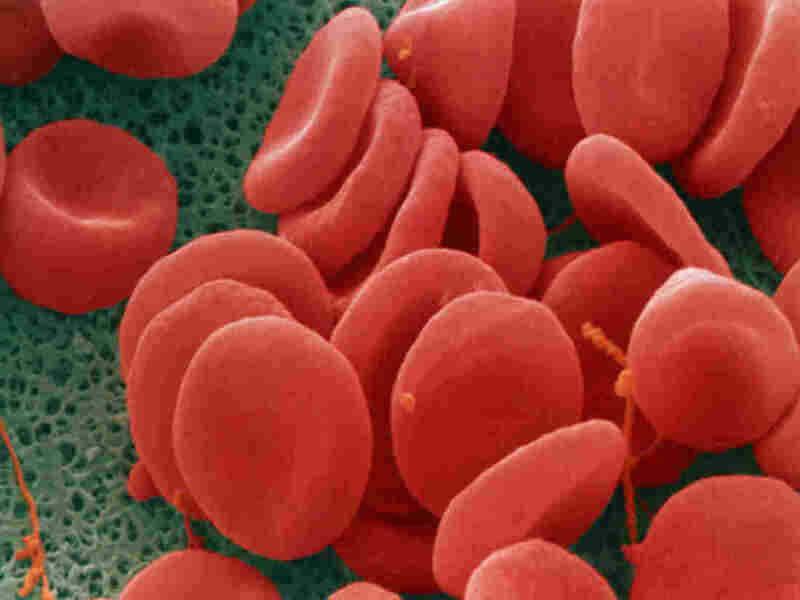 Blood does change color somewhat as oxygen is absorbed and replenished. But it doesn't change from red to blue. It changes from red to dark red. It is true that veins, which are sometimes visible through the skin, may look bluish. Why should this be so? Click here if you want the full story. But the short of it is this: It has to do with the way tissue absorbs, scatters and reflects light. (I think this also explains why your lips look blue when you get cold.) But if you were to open one of your veins, or cut your lip, even when you're cold, there'd be nothing blue at all about the liquid that would pour forth. Maybe it is the fact that veins look bluish that explains the myth that blood is blue as it flows through the veins? Or could the answer lie elsewhere? By convention arteries are drawn red in textbooks and veins blue. Could it be that people have taken this to be a guide to their actual color? I think this is worth understanding. It's a politically neutral example of a bit of falsehood that seems resistant to information. At a time when ignorant people openly challenge scientific knowledge about such important matters as the safety of vaccines or the dangers posed by the burning of fossil fuels, it seems worthwhile to try to understand why some bad ideas are so immune to revision. Here's a hypothesis: The problem is not outright ignorance. You can imagine children — who may have never seen an accident, or been cut, or had blood drawn or taken a biology class — who might gullibly believe that blood is blue, because someone told them so. Even people who have been cut, or have witnessed an accident scene, or had blood drawn, cleave to the conviction of blood's sometime blueness. Such conviction and confidence when everything — when all the evidence — speaks loudly against, can only be the result of some prejudice or bias. But what? Why? A little knowledge, it turns out, can be a dangerous thing. It's hard to disprove a falsehood when it seems to fit so seamlessly with other true, if poorly understood, propositions. That's what's going on here, it would seem. Take a little blood chemistry, exposure to textbooks and the sight of your own naked arms, and you get a perfect ecosystem in which to nourish a manifestly false belief. Thanks to Ulysses Noë for adding to this discussion.